Stephen V. Ramey (ed. ), Triangulation: Morning After. PARSEC Ink, 2012. Pp. 209. ISBN 978-09828606-2-5. $15.00. 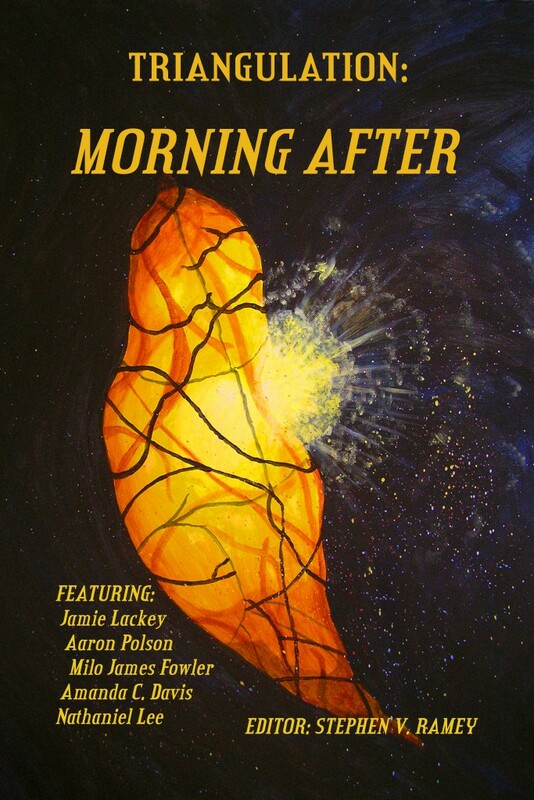 This collection of twenty-four original stories is the eighteenth annual release in the Triangulation series from the writers’ group PARSEC which is also the Con-runner for the Pittsburgh, PA Confluence. The anthology series has earned a long-standing and very positive reputation for providing a platform for new writers, a reputation which is well continued in this varied collection of stories. “As you ride around the beast, try to keep your horse calm,” the Lamassu fixes his eyes upon me. I am barely a swirl of dust upon the breeze, a few twigs and dried leaves my only substance. This sudden acknowledgement of my existence is surprising. He whispers in a tongue that knows neither land nor time, the tongue of those who exist betwixt and between. While some of my delight in the story comes from shared experience—I lived in Greece for seven years—I was also moved by the way in which the author presents Thessalonike’s passion and willingness to do anything—even die—to save her brother. When her efforts are thwarted by the brother she is trying to save, she accepts the harsh terms of her immortality and wrests a triumph even from that. So much writing about ancient Greece wallows in the same old troughs, Odysseus, Heracles, the Trojan Wars or the Olympian Gods, that it has for me, become very same-old-same-old. Ms Lucas has presented a fresh and engrossing look at a different family of Greek mythological figures and in doing so made a powerful statement about duty and destiny. From another continent and time, De Anna Knippling’s ‘The Third Portal’ will resonate powerfully with anyone who has had to deal with a malleable daughter’s transformation into a teenager. In a country fighting a war against the unknown accessed through a mysterious third portal, a woman’s daughter volunteers to go and fight. She knows that when her daughter returns she will not be the same. What she does not expect is to have her daughter’s body returned to her inhabited by mind of an alien. ‘Orbium’ by Kalisa Lessnau provides a clever illustration of why it is never a good idea to underestimate the power and vindictiveness of a disturbed spirit. When a greedy magician kills her creator, Kirst not only out-smarts him but realises she can assume her master’s place. While in ‘That Goldurned Hole’ by Gary Cuba, a canny farmer and his dog not only resist Cthulhu’s temptations, but succeed in making some money in the process. We also have stories of true love triumphing over death in ‘The House, the Gardens, and the Occupant’ by Amanda C. Davis and H. M. McGinnis’s ‘How the Caterpillar Cheated Death’. Two stories, Jamie Lackey’s ‘Protection from Darkness’, and ‘All Unlooked For’ by Nathaniel Lee, explore the benefits and detractions of our deep relationships with animals, the former with a very special kitten and the latter a well-meaning but clueless squirrel. In ‘Nyabinghi’s Sacred Drum’ by Susan Urbanek Linville, Ms Linville’s earlier collaboration with Twesigye Jackson Kagiri show itself in the language and rhythms creating the feel of an African fairy-tale. After the murder of her husband, the King of Rwanda, by the invading Europeans, Muhumusa returns to her own country, Uganda, with her son, the king’s heir. Determined to save her people she sets out to find and secure Nyabinghi’s Sacred Drum, which is said to possess the power to stop bullets. After many trials and reversals she returns to her starting place only to discover that the ‘drum’ is a metaphor for a leader of the people. But, as always, there is a ferocious price to be paid; she must leave her son with Nyabinghi. Like ‘What Now Calisthenes’, this story paints a vivid picture of the challenges and sacrifices that those sincerely trying to do good must face and overcome. It seems to me that the world we live in has become so brutish and cynical, that faith, courage and passion for something not ourselves have become the stuff of fairy-tales. These stories remind us that once upon a time it might have been different. When I read through my notes, it becomes clear to me that the strongest stories in the collection are concerned with sacrifice and saving others. As well as the stories already mentioned, the beautiful fairytale-like ‘Nocte Finem’, by Henry Tjernlund tells of the quest-journey undertaken by Johnathon, a soldier, and the witch’s daughter Samantha. In language by turns lyrical and funny they set out to free their land from the darkness imposed by the evil Septimus. While all of the stories were well written and very close to professional standards, not everything appealed to me. There were a couple of zombie stories, which I’m tired of, and two semi-religious satirical pieces, which to me seemed too pleased with their own cleverness. I was also disturbed to notice that in a selection of 24 stories, covering a wide and diverse range of topics and tropes, not one had any LGBT characters. Surely the editors could have found something to represent this spectrum of the SFF writing world. Another thing that perplexed me was that in many cases I had difficulty discerning how the title prompt, Morning After, related to the stories. Since the stories that seemed the most powerful to me all related to self-sacrifice, I wonder if a different prompt and a more rigorous attempt to create a homogenous set of stories on a recognisable topic might have resulted in a more marketable offering. Reading the end notes on page 210, it is clear that commercial success is a necessity if the series is to continue in its present form. Nonetheless, I can recommend this as a pleasant way to spend a few hours on a miserable afternoon. I read most of it while an unexpected October snow-storm dumped 5-6 cms of snow on my unsuspecting island. I was very happy to be inside, warm and dry, with my cat on my lap and this varied, mostly engrossing but somewhat uneven collection of stories to occupy my time. A mug of hot chocolate would also go well with these.